During a wedding reception at Crystal Fountain I had the opportunity to catch multiple a series of candid photographs that any wedding photographer would be proud to include in his portfolio. This particular image immortalized one of those moments that make us all re-live our childhood memories. 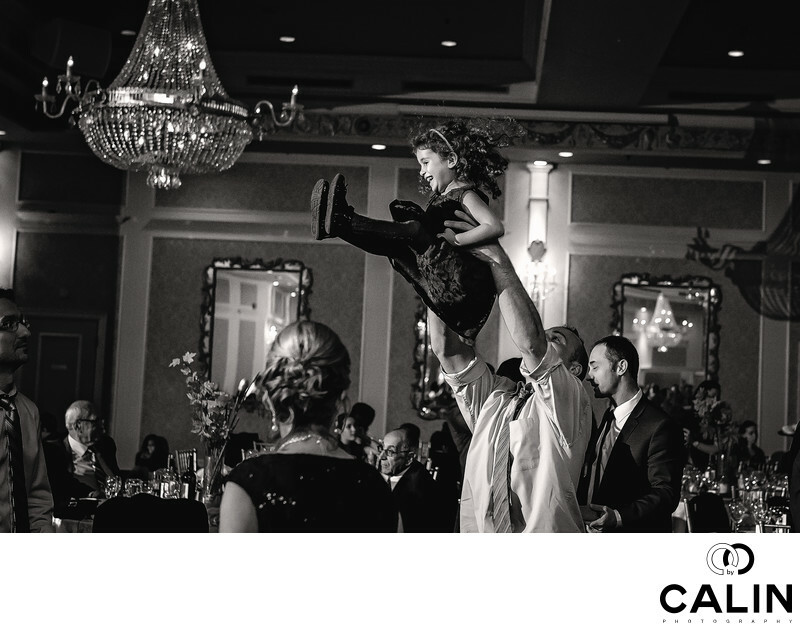 While the bride and groom were dancing this father threw his daughter in the air as if they were the only ones at the wedding. I absolutely love the emotion of this photograph and its composition. The Crystal Fountain chandelier balances perfectly the father and daughter and give a visually balanced image. Chandelier, the daughter and the father are placed along the sinister diagonal which gives this photograph a beautiful flow. The viewers eye enters the left of the frame, encounters the chandelier then the daughter suspended in the air and finally the father. The father's hands create a visual leading line towards a daughter and are parallel to this reciprocal diagonal. The lady in the foreground is also looking at the father and daughter which accomplishes a few things. First the three subjects create a triangle, a very appealing geometrical shape for the human eye. Second her presence in the foreground gives the image depth. Also very important, she looks towards them and that creates a virtual leading line towards the main subject in this image, the father and daughter. As this is a candid or moment, I chose a black and white processing that I believe works better with the image. Location: 60 McDowell Gate, Markham, ON L6G 1B5, Canada.